This page will explain all Options found under Tools > Options. What is the Options screen? Options are generally practice-wide preferences and settings. Options will contain practice information, patient statement settings, and Gateway EDI settings, among others. Options can be found under the tools drop-down menu in the upper-left portion of the main screen of TRAKnet. The Options screen is broken down into several categories, with the settings beneath each relating to that category. These are as follows. This category will contain general billing preferences. Auto-fill Diagnoses Pointers -– Setting this to True will cause TRAKnet to automatically assign diagnoses pointers to treatments on the invoice based upon the order in which they are entered. Auto-Set Patient Responsibility -– Setting this option to True will cause treatments to automatically set to Patient Responsible after posting an insurance payment. Allow $0 to go to Patient Responsibility -– If set to true, any line item that an insurance pays $0 on will automatically become patient responsible. Patient Invoice Tab — This setting will default which view of the Invoice will open first: The Charges view, Charges (Edit Mode), or Payments. Default Days on Invoice History — The default days for patient treatment history when opening the patient invoice. Use Fee Schedule Pricing -– If set to true, treatments will use the scheduled fee per the insurance company, when available. If false, the treatment’s base price will be used as the fee. Set Referring Provider on Claims — Set the referring provider on claims from either the referring provider or primary physician field. Set Supervising Provider on Claims — Setting this allows the user to set the default supervising provider on claims. Medicare NONE — Setting this to True will default the patient insurance group number to NONE for Medicare. 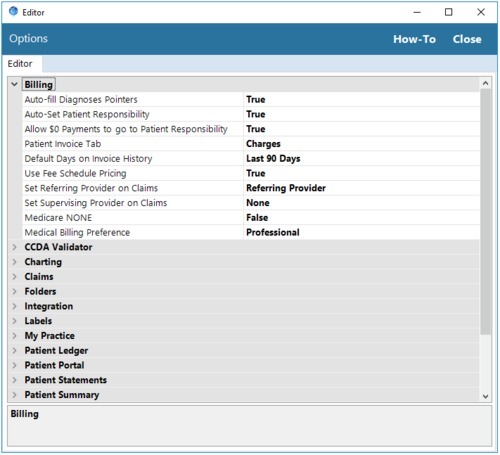 Medical Billing Preference — This setting will allow the user to decide which is the default for encounters that are created: Professional claims or Institutional claims. This will default to Professional. This category will contain the CCDA validator option. CCDA Validator — When set to True TRAKnet will validate all incoming CCDA's. When set to False incoming CCDA's will be imported without being validated. This category will contain preferences for encounter format. Default Account Number Length — The default maximum patient account number length. Encounter Number Prefix -– Allows you to default a prefix that will be added to the encounter numbers, up to a maximum of four characters. This category will contain settings to modify and format claims, both electronically and paper. Default Claim Output -– This setting will determine the default output, such as paper or ANSI, for all claims. Use Note Date as Onset Date -– Setting this to True will automatically set the Onset Date for the present illness as the encounter date. CMS 1500: Top Margin -– This setting will allow you to adjust the top margin on the CMS form. CMS 1500: Left Margin –- This setting will allow you to adjust the left margin on the CMS form. CMS 1500: Year Format -– Setting this option to true will cause the CMS form to use a CCYY format in box 24A of the CMS 1500. CMS 1500: Use Patient Signature –- Setting this option to True will insert “Signature on File” rather than “SOF” onto the CMS 1500 form, when applicable. CMS 1500: Use Provider Signature –- Setting this option to True will use the provider’s signature on the CMS 1500, when applicable. UB04: Top Margin — This setting will allow you to adjust the top margin on a UB04 form. UB04: Left Margin — This setting will allow you to adjust the left margin on a UB04 form. UB04: Type of Bill (Box 4) — This setting will allow you to default the type of bill that will populate into Box 4 on a UB04. This setting will allow you to indicate your desired file path for your Multimedia folder. Data Export Location — This will be the default location for exported files. In this category, you will enter your 20/20 imaging URL to allow for 20/20 imaging integration in your patient’s chart. A2D2 — This category allows for integration with A2D2 imaging systems. There are two fields: A2D2 folder, which is defaulted to the Network folder, e.g. C:\ProgramData\NEMO Capital Partners\TRAKnet PM\2.00\A2D2; and Auto Export to A2D2 True/False. If True, patient demographics will export to A2D2 whenever a patient record is updated. InterFax — This category allows for integration with the InterFax digital faxing option. Use InterFax — When set to True faxes will be sent using the InterFax digital faxing option. InterFax User Name — This is the username for the InterFax account that will be associated with TRAKnet. InterFax Password — This is the password associated with the user name. MedXpress — This category allows for integration with MedXpress for submission of CMS reporting. MedXpress Account ID — This is the account ID for the MedXpress account to be associated with TRAKnet (Note all entries must be in capital letters). MedXpress Password — This is the password associated with the MedXpress account ID. OpalRAD/Spectacle URL — OpalRAD/Spectacle URL used in conjunction with the patient's account number to open patient images in 20/20. TigerView — This field will contain the filepath for the TigerView application on this PC. This is generally C:\Program Files\TigerView\Tiger1.exe. These options will allow you to customize the printing of mailing and appointment labels from the scheduler. Disable Printer — If this option is set to true, label printing will be disabled. Size — This setting toggles between 2.25" X 1.25" and 2.25" X 3.00" label sizes. Paper Bin — If applicable, this setting allows you to choose which paper bin the printer will use to print. Orientation — This setting toggles between Landscape and Portrait text orientation on the label. Left Margin — This setting will allow you to adjust the left margin on a label. Right Margin — This setting will allow you to adjust the right margin on a label. Top Margin — This setting will allow you to adjust the top margin on a label. Bottom Margin — This setting will allow you to adjust the bottom margin on a label. This category will contain your practice’s information for billing purposes. This will populate box 33 on the CMS 1500 form. Practice Name –- This will be the full legal name of your practice. Registration Number -– This will be the registration number generated for you to access TRAKnet. This is your TRAKnet 2.0 registration number and is not needed for 3.0. Practice FEIN –- Practice Federal Employer Identification Number. Practice NPI -– Practice National Provider Identifier. Practice Address, City, State, Zip, Phone, Fax -– Various address and contact information for your practice can be entered here. Practice Taxonomy Code –- The Taxonomy Code for your practice will be entered here. These options will allow you to customize your view of the patient’s ledger. Expand All –- This option will default the appearance of your ledger to either always expand all fields or always collapse all fields. Default Ledger Range –- This setting will determine the default date range for your patient’s ledger. Default SHow Allowed — This setting will show the allowed amount by default on the patient ledger when set to True. This option will allow you to adjust the patient portal settings. Default Payment Type — This will set the Default payment type used when patients make a payment through the patient portal. Push Type — This setting changes the local database data push from Synchronous to Asynchronous. This category will contain several options that will allow you to default and customize your patient statements to fit your particular needs. Monthly Day Due –- This option will allow you to set a default monthly due date for all patients. Save Printed Statements –- Setting this option to True will save a copy of your patient statements in your multimedia file. Statement Clearinghouse — This setting sets the clearing house statements will be sent to when exported. Statement Type — This option will determine if detailed statements or simple statements are printed from TRAKnet. Print Practice Info –- If set to True, the practice name and address information will print on patient statements. Default Statement Message -– Allows for a default statement message to print on all statements. 30 day Statement Message -– Allows for a message specific to statements that are 30 days past due. 60 day Statement Message -– Allows for a message specific to statements that are 60 days past due. 90 day Statement Message -– Allows for a message specific to statements that are 90 days past due. Print Credit Card Info –- If set to true, credit care preference information will print on patient statements. Accept MasterCard -– Display MasterCard as a payment type on statements. Accept Visa –- Display Visa as a payment type on statements. Accept American Express -– Display American Express as a payment type on statements. Accept Discover –- Display Discover as a payment type on statements. Minimum Balance Default — The minimum balance amount when opening the statements window. If $0, then no minimum is set. Maximum Balance Default — The maximum balance amount when opening the statements window. If $0, then no maximum is set. Days Past Due Default — The minimum days past due when opening the statements window. If 0, then no minimum is set. Days Since Last Statement — The minimum days since the last statement was generated when opening the statements window. If 0, then no minimum is set. Monthly Due Date — The default monthly due date when opening the statements window. If 0, then no due date is set. Remit to Location — The default remit to location when opening the statements window. Show Paid Line Items — When set to True paid line items will show on the patients' statement. Paid Line Item Age — This determines the oldest age for paid line items when Show Paid Line Items is set to True. This category will allow you to indicate defaults on your patient summary that can be printed from the patient’s chart under Actions > Summary. Font Size — Allows for a default font size to be set. Minimum of 8pt and maximum of 14pt. SSN — Print SSN number on summaries by default? Billing — Print billing information on summaries by default? Insurance — Print insurance information on summaries by default? Other — Print other information on summaries by default? This includes Date Last Seen. Comments — Print patient comments on summaries by default? Reminders — Print patient related reminders on summaries by default? History — Print patient history information on summaries by default? Appointments — Print patient past and future appointments on summaries by default? Encounters — Print patient encounters on summaries by default? Referral Letters — Print record of referral letters on summaries by default? Prescriptions — Print prescriptions on summaries by default? Transactions — Print a history of transactions on summaries by default? Co-Payments — Print a history of co-pays on summaries by default? This category allows the practice to set the method of reporting for MIPS/MACRA Quality Measures. Reporting Method — This setting can be set to None, Claims, Registry and will determine what method is used when reporting quality measures. This category contains preferences for scanning. Scan Method — Version 1 is the method of scanning prior to the November 2015 update. Version 2 is the method of scanning implemented in the November update and is recommended for scanning. Use Scanner Driver Interface — When True, open the scanner driver UI when a document is scanned. Use Scanner Feeder — Set to True if your scanner is a document feeder scanner. Set to False if your scanner is a flatbed scanner. Default File Type — This will default the scan file type to Image or PDF. This category will allow you to set preferences for Security Questions. Set Session Timeout — In an increment of minutes, with 1 being the minimum. This will determine how long TRAKnet will remain idle before TRAKnet will time out. Use Security Questions –- If set to True, security questions will be required to log in. Minimum Number of Security Questions – This setting will determine how many security questions you would like to use. This category controls defaults for the SmartSheet10 tab. Default Column Sort — This can be set to ICD-10 Code, ICD-10 Description, ICD-9 Code, or ICD-9 Description. This will default how SmartSheets sort. Search SNOMEDCT Codes - This determines whether or not adding of SnoMED codes to SmartSheet10 records is on or off. This setting will contain the Virtual Terminal URL for TransFirst integration. This will come preloaded. It should be: https://vt.transactionexpress.com/.